Looking for a great low-impact activity while you recover from a sports or fitness injury? Searching for a fresh, fun exercise to keep you active in the late summer and early fall months? It may be time for you to head outdoors and hit the trails! 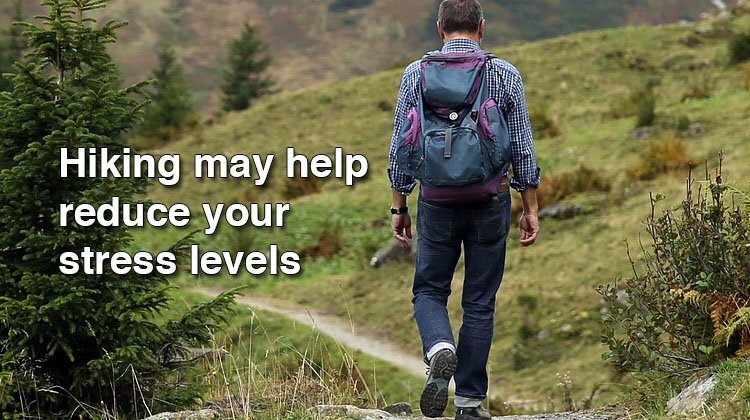 When it comes to traversing even mild to moderate hiking trails, the health benefits still add up. Hiking is a great option for arthritis sufferers because it is easy on the joints, boosts blood circulation, and helps build strong muscles and bones. Hiking may help reduce your stress levels. A 2015 study found that spending time walking outdoors through lush greenery (versus a bustling urban environment) helped enhance feelings of happiness and attentiveness. Hiking provides an aerobic workout for your body, boosting your heart rate and blood flow, which can help lower risk of heart attack, stroke, and other cardiovascular diseases. Hiking may help you manage a healthy weight. More challenging hikes, i.e. on rockier or steeper terrains, will help you burn more calories, an estimated 430 calories per hour (for a 160 lb person) and an estimated 550 calories per hour (for a 200 lb person). Hiking even while wearing sun protection helps you get healthy amounts of sunlight which your body converts into Vitamin D to help support strong bone and immune health. Hike can improve coordination skills which is especially significant for older adults. Navigating winding and varying terrains and environments, and honing your sense of balance when walking over tree roots and other environmental obstacles provides exercise for the eyes, muscles, and brain all working together. Hiking for at least an hour is sure to get the heart rate and breath rate up, providing a work out for your respiratory system and helping strengthen the lungs. Hiking with friends is a great social activity, especially when you couple it with a picnic or photo shoot at the top of your summit. Social interaction is key to stimulating brain activity that may potentially help stave off cognitive decline down the line. Don’t forget to wear sun protection and take helpful items on your hike with you (in a small backpack, for example); these may include water, first aid items, snacks, flashlight, physical map, and compass. Wear proper fitting hiking boots or shoes that can support strong movement and stabilize the ankle (and don’t cause blisters or other skin irritation). If recovering from an injury to weight bearing joint like the knee or ankle, make sure to wear an orthotic brace or use supports like walking sticks to prevent further reinjury. Chances are your smartphone will not have service on hiking trails further out into the wilderness. If hiking solo, alert a friend or neighbor that you are going, and always have a paper map on hand incase you get lost. Don’t leave a trace! The proper way to be in nature is to leave it as you found it – don’t litter and don’t remove items from the trail or woods around you. If just dipping your toe into a hiking hobby, start with a beginner trail that suits your fitness levels. Familiarize yourself with local terrain and landmarks. Learn hiking jargon and common trail terminology so you are prepared to recognize things like trail markers, switchbacks, and cairns. Check the weather before you head out on the trail to make sure you don’t get caught in something inclement like a thunderstorm. Hiking provides an all body workout that engages many key muscle groups to strengthen your power and endurance while at the same time enlisting your brain in mindful meditation and natural exploration. Check with your local outdoors center for a list of great hiking trails to try!